Coming out is hard, and a non-supportive situation only makes it harder. In this episode we answer a question a lot of listeners have asked: How do you come out when your family, friends, co-workers, and neighborhood may not be supportive? To get some insight from someone who did just that, we talk with Brooke Guinan. She's the first openly transgender firefighter in the FDNY, the New York City Fire Department. 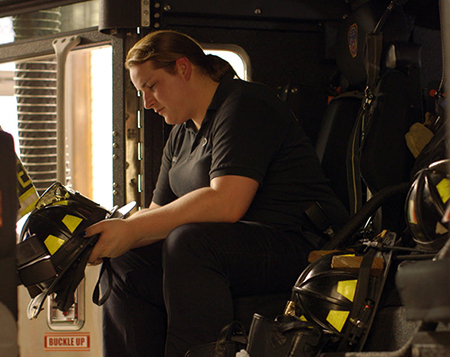 We'll learn about this third-generation firefighter who grew up steeped in tradition, and how she found the courage to come out and be her true self. Be sure and check out the new documentary film, Woman on Fire, which tells Brooke's story. It was awarded an Official Selection at DOC NYC. We saw an advanced copy and this movie is funny, heartfelt, and moving. Check out the trailer here or watch now on iTunes. Also, Brooke mentioned GSA, Gay Student Alliance Network, which is a student-led organization dedicated to helping LGBTQ junior high and high school students. They support each other and provide safe spaces to be who they are. Support us on Patreon to help us keep making great content, and to get some cool rewards-- like drinks with us at Stonewall Inn! Check out our website for our latest episodes! Like us on FaceBook so we can haunt your feed. Music by one of our favorite bands, the super cool, all-female punk band Jasper the Colossal. Download their new album "Take Your Time" and all their tracks on iTunes. What If You Can't Escape Your Dead Name? Are Transgender People in League with Satan? Should I Tell My Date I'm Trans? HRT: Should I Tell My Parents? How Can I Be More Than a Burden to My Cis Partner?